���� In 1942 Canadian Wing Commander Max Vatan (Brad Pitt), on secondment to British SOE, is parachuted into French Morocco. His assignment is to link up with French Resistance operative Marianne Beausejour (Marion Cotillard) in Casablanca and pretend to be her husband until the two of them can assassinate the German Ambassador. The mission succeeds but the pretend marriage turns into genuine love. Max is allowed to bring Marianne out of Morocco to London, they marry and later Marianne has a baby girl in the middle of an air raid. Max has a desk job and the happy couple set up home in London. ���� One year passes. Then Max is suddenly called in by British security and informed that they have evidence that Marianne is a German spy, passing on information to Berlin. Max cannot believe it nor accept that his wife, and mother of his daughter, is a traitor. If she is, the protocol required to prove that Max is not assisting Marianne is that he will have to execute her. An operation is put in place to feed Marianne false information that only she has access to and see if it is forwarded to Germany. This will take 72 hours, over the weekend. In that time, and against orders, Max sets out to prove that Marianne is innocent including making a clandestine flight to France. But will his faith and determination be enough? ���� Allied is an epic wartime romance thriller from director Robert Zemeckis. Much of his filmography is more light-hearted fare; he won an Oscar for Forrest Gump (1994) but he is also no stranger to CGI heavy films having directed The Polar Express (2004) and Beowulf (2007). As the extra features on this disc show many of the scenes in Allied were shot before a blue screen and the backgrounds added digitally. Mostly this works well with sequences in the war time London streets, the bomber airbase and the street and club in Casablanca giving the film an epic scope it would not otherwise have. However other CGI, such as the crashing bomber, is not as effective. ���� The beautiful costumes, elaborate sets, authentic period vehicles and aircraft of Allied result in a film that is sumptuous to look at, a film which also has considerable star power in Brad Pitt and Marion Cotillard in the leading roles. 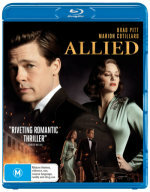 Indeed, they carry Allied throughout its two hour running time because the film is pretty much a two hander; other characters such as Max�s sister Bridget (Lizzy Caplan) or his friend George (Daniel Betts) are peripheral and have very little to do, the only exception being Max�s superior officer Frank Heslop (Jared Harris). For much of the early part of the film Brad Pitt is Brad Pitt, resourceful hero and leading man, although when Max has doubts and begins to question Marianne�s loyalty Pitt is much better, showing his uncertainly in expressions and glances. Marion Cotillard in contrast is excellent throughout; an Oscar winner for La Vie en Rose (2007), she graces almost anything she is in, even when wasted as in Assassin�s Creed (2016). Allied would be a far lesser film without her and she looks fabulous in the 1940s clothes, including evening gowns, she wears in the film. ���� With such a cast, glorious visuals, period detail, action and drama, including potentially having to execute the woman you love, it is perhaps surprising that the critics were less than impressed with Allied; it currently rates a critic score of 59% on rottentomotoes.com with the audience score only slightly higher at 64%. While acknowledging the costumes and settings, and the glamour of the film, words used by critics include �lifeless�, �insipid�, �empty shell�. I was a bit nonplussed by this reaction; Allied is by no means perfect but what it does by way of spectacle, action and drama it does pretty well. The problem, to my mind, is a performance by Pitt that is less than completely convincing so that the romance and moral dilemma are not as highly charged as they should be. As this is at the centre of the film, it does reduce the impact of the climax. ���� I say �reduce� on purpose, for to me this is still a good, well-constructed, entertaining film. There is a lot to enjoy in the performances and the look of the film, the technical merits and production design are exceptional. Allied is a better film than some that are much higher on the ratings scale! ���� Allied is presented in an aspect ratio of 2.40:1, in 1080p using the MPEG-4 AVC code. ���� Shot digitally, often in the studio in front of blue screens, Allied is every bit as detailed as one should expect it to be. The war time London streets, the bomber airbase and especially the club in Casablanca look stunning. The interior of the club and the Vatan house in London also look fabulous, the costumes, especially the green evening gown worn by Marianne to assassinate the German Ambassador, are beautiful, the authentic period cars, trucks and aircraft impressive. The Morocco scenes have a yellow / brown palate, suitable for the desert setting; the London suburban streets are leafy and green. Indeed, overall the colours are deep and natural. Blacks and shadow detail are excellent, so much so that the crashing CGI German bomber is shown up. Skin tones are natural, brightness and contrast consistent. Other than some slight motion blur, marks and artefacts are not present. ���� English and English subtitles for the hearing impaired are available plus Spanish, French and Portuguese. Subtitles also automatically translate the sections of French dialogue. ���� The audio is English DTS-HD MA 5.1, there are Spanish, French and Portuguese dubs in Dolby Digital 5.1 and an English descriptive audio with a male voice (Dolby Digital 5.1). ���� This is a subtle audio track with music and ambient effects, such as rain and voices, in the rears and surrounds. During the action the shots were loud, impacts and bodies falling to the floor thud appropriately. The most impressive sequences were the bombing raids on London with anti-aircraft tracers, explosions and engines overhead and panning effect as a burning bomber passes just overhead and crashes. The subwoofer was active adding rumble to the engines and explosions. The dialogue was clear and easy to understand. ���� The original score by Alan Silvestri was varied and effective. ���� The extra features are in separate sections but they are really all part of one �Making Of� with a total running time of 67:54. They utilise film clips, on-set behind the scenes footage, many showing the blue screen work, archival footage of the London Blitz, stills, concept art, sketches and interviews with a wide range of the crew, including director Robert Zemeckis, producers, the DP, costume, SFX and production designers and various producers. Other than Marion Cotillard, however, there is only slight input from the other cast and Brad Pitt is nowhere to be seen. The sections can be selected individually or there is a Play All option. Taken together, they are a decent look at the production. ���� The screenplay, the story and the history. Extra comments from writer Steven Knight. ���� A look at the set design and decoration, including creating Casablanca, wartime London, the wartime offices and homes. The film was shot on inside sets and the environments expanded using extensive blue screen and visual effects and there is a bit of rather self-serving criticism in this extra of directors who insist on shooting on location rather than the �safe� environs of a set. Additional comments from the production designer Gary Freeman and VFX supervisor Kevin Baillie. ���� Various people, including DP Don Burgess speak about Zemeckis�s body of work, his techniques and style. ���� Costume designer Joanna Johnston shows sketches and takes us through the design of a number of the costumes as well as the fabrics. ���� The personal attributes of, and working with, Marion Cotillard and Brad Pitt. ���� Jared Harris, Lizzy Caplan, Daniel Betts, Charlotte Hope and Anton Lessor talk about their experiences on set. ���� There were over 700 visual effects shots in Allied; this segment looks at a number of them and includes previsualization, blue screen filming and finished footage comparisons. ���� The 1940s vintage cars and the Lysander aircraft used in the film. ���� The authentic Sten guns and pistols. ���� Composer Alan Silvestri at work writing and recording the score and his relationship with Zemeckis. ���� Our release is identical to the Region A/B US Blu-ray of Allied, including the FBI piracy warning. ���� I am not as critical of Allied as some. It is by no means perfect but I enjoyed the thriller elements, the drama, the moral dilemma posed, the wartime period setting, the costumes and the performance of Marion Cotillard that almost elevates the climax to another level. Allied is a better film than the rottentomatoes.com scores suggest so if the period, the genre or the stars appeal at least give it a look and make up your own mind. ���� The video is sumptuous, the audio very good, the extras genuine, resulting in a decent Blu-ray package for those prepared to give the film a go.